UVdesk - How to create a ticket in UVdesk? Tickets are nothing but the support email created by the users ( clients or customers). 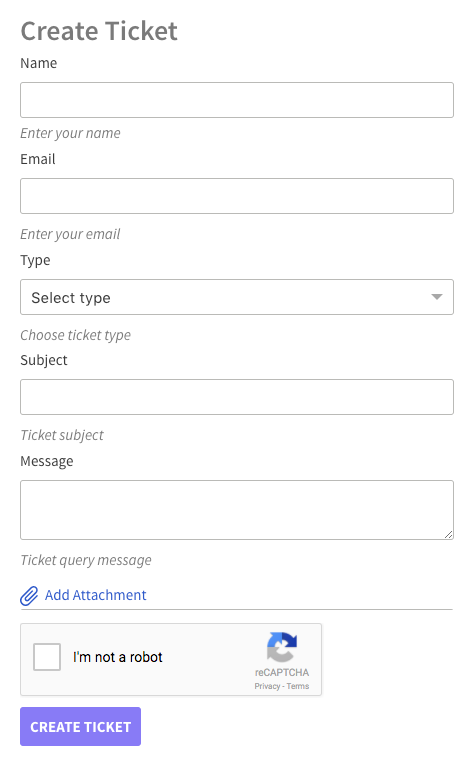 Tickets are created when the user sends mail to the support email address. The support staff or the agent can also create a ticket directly from the UVdesk Portal on behalf of the customers. The user can also create a direct ticket from the Support Panel of your site. After setting up the Mailbox, emails coming to your support mail address will automatically get converted into tickets. The support staff or the agents can see the ticket on the UVdesk Panel and reply on the ticket as per the solution. Your customers can create tickets from support panel of your site, with or without login based on Settings. Visit your UVdesk support site. On the header, click on Create Ticket button. You will be directed to ticket create page where you have to fill the required fields for the ticket creation. In Settings Section, under Branding, if Login Required To Create Tickets is selected then the user have to log in first and then they can create a ticket. On the Dashboard, you will see a plus (+) sign on the top right side corner. Click on "Ticket" option and then a form will pop-up. 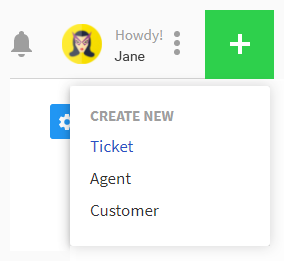 Enter details like Name, Email, select Type, Subject, Ticket subject and click on "Create Ticket" button to create a ticket on behalf of the customer.